Food Adventures of a Comfort Cook: Men can be such girls. Men can be such girls. “My shirt doesn’t fit right.” – Of course not, you keep wearing it as soon as I wash it, so it’s shrinking, and your belly is growing. “Does this shirt go with my jeans?” – Do I look like the fashion police; anything goes with jeans. “There’s nothing to eat” – As he surveys the refrigerator full of food. “I’m dying, and you don’t love me” – He says, since I’m not showing enough sympathy about his cold, fetching the remote, nor catering to his every whim while he lounges on the couch. Then there are the toys; the vehicles which are so big, even they need a step stool to get up into it. Or the amount of vehicles they purchase, and the front lawn looks like a parking lot. Bragging rights, sure enough; but some of them are overcompensating for a shortage somewhere – not getting into that. Hmm, almost sounds like women who have a closet stuffed with shoes. The video games they play for hours on end; then complain when they have nightmares about them. Or the new game that came out, but the household budget says it can’t be purchased today. “But I want it!! !”, he cries which makes me picture a five year old girl stomping her foot and holding her breath over the Barbie doll she can’t have. Now don’t be under the misconception that I’m only talking about my husband, I most definitely am not. I’ve seen it in friends’ husbands or significant others, male friends or relatives, and strangers in a store. Men can be such girls, and I don’t care how much testosterone a man has (or claims to have), it’s funny as all heck. While today may be April Fool’s Day, I get the feeling that our men enjoy playing games with us more often than that. It gets frustrating at times, but we drive them nuts too, so it all evens out in the end. So, when it gets to be just a little too much, here’s an easy and quick recipe to make. No muss, no fuss; and while you’re both eating…..quiet time. In a large stockpot, heat oil on high heat and sauté onion till just starting to soften. Add in wine, water and broth; bring to a boil. Add in beans, tortellini, thyme and pepper; reduce heat to medium. 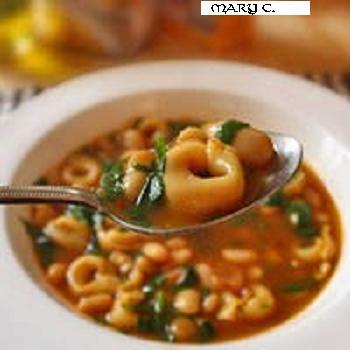 If using fresh or frozen tortellini, cook for 8 minutes; dried for 10 minutes; taste for doneness of pasta.